In one shot in the movie, as the spacecraft traveled towards Pandora, in the background was Jupiter - much larger and easy to identify by one of its signature red spots. http://en.wikipedia.org/wiki/Avatar_%282009_film%29 wrote: The film is set in the year 2154 on Pandora, a moon in the Alpha Centauri star system. Nowhere near Jupiter. 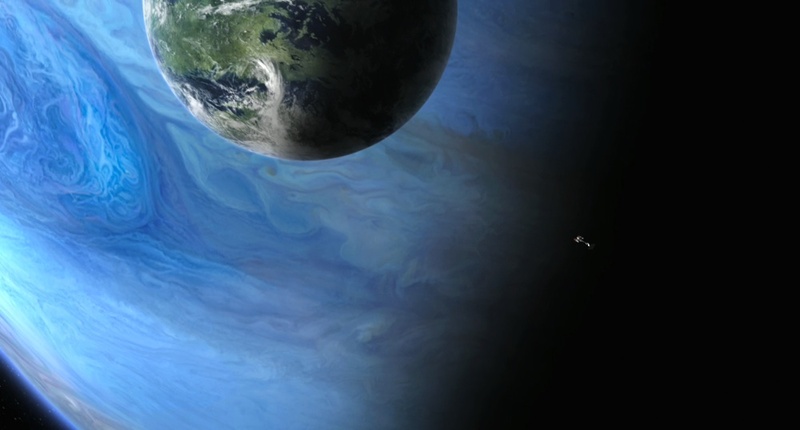 Fictional gas giant that was blue, not red. I did wonder what would happen to Pandora when it ended up in the gas giant's shadow. But it's not like you can tell if it orbits its parent in a way that would ever put it in the shadow. smita wrote: Is Pandora near Jupiter? The story may put Pandora far away from Earth, but the Jupiter shot in the background was unmistakable. What shot of Jupiter are you talking about? Do we even have any photos of Jupiter at that resolution? I'm willing to bet that that blue gas giant is either a matte painting or completely computer generated. Certainly it was inspired by the swirls of clouds seen on Jupiter and possibly Saturn too but it is not a photo of Jupiter itself. Well, when exactly I will tell you when I go the see the movie again. If my memory serves me right, it is when they are going toward Pandora. I do not know if it was computer-generated or an APOD image put in the background, but the left side of the screen is fully covered with the famous impage of Jupiter with its red dot in the background. The background image is so large that it cannot be that far from that planet. It would almost look like what Jupiter would look to us if it was as close to earth as moon (well may be we would all be dead by its gravity, but who is talking science here). As for the story, it is fiction - science fiction - so yes it can be anywhere. That's really not the point. Jupiter-inspired giant storm? Yes. Photo of Jupiter? No. Yes, that's the one. Thank you. I am with the people of Pandora. About those floating mountains that were never explained... Was that a moose I saw in the jungle? "Hey, Rocky! I found the upsidasium!" In the new blockbuster Avatar, humans visit the habitable - and inhabited - alien moon called Pandora. Life-bearing moons like Pandora or the Star Wars forest moon of Endor are a staple of science fiction. With NASA's Kepler mission showing the potential to detect Earth-sized objects, habitable moons may soon become science fact. If we find them nearby, a new paper by Smithsonian astronomer Lisa Kaltenegger shows that the James Webb Space Telescope (JWST) will be able to study their atmospheres and detect key gases like carbon dioxide, oxygen, and water vapor.